10 Tips For Making Money with Social Media photoTurning a profit using social media, for some, is as elusive as a white rhino. But, it doesn’t have to be. Think of social networks as a big party and try to fit in — not be the life of the party. 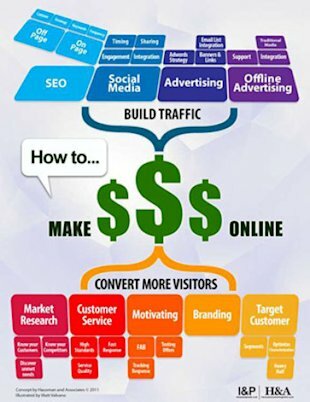 My Infographic, courtesy of my partner, Ideas and Pixels, shows great tools for making money with social media — and other tools for making money online. Many of these tools fit together to create an integrated online marketing strategy to support your online marketing goals. But, you need to go beyond these tools to know HOW to apply them to making money with social media. Social media isn’t like traditional advertising and it shouldn’t look and feel the same. Social media is a community designed to share comfort, support, information, expertise, and entertainment. You need to develop a voice in social media — one that talks like a real person, shares like a real person, and that people can relate to as a real person. Share your foibles, mistakes, sense of humor, and what’s going on in your life. Let people backstage. If folks are having fun sharing on social networks, join in. Don’t bring the party down by talking about yourself. Have fun with them or create your own fun. Share something interesting — something of value. Social media is definitely a pay-it-forward world and if you don’t get that, then hire someone who does. I give away tons of valuable stuff — like the first chapter of my new social media analytics book. Grab a copy today and let me know what you think. No strings attached. And, if you give me feedback or edit my work, I’ll send you a PDF of the book when it’s finished. What a deal! Don’t fish where your boat is, fish where the fish are. You’ll be more successful. If the fish aren’t biting, move your boat. For instance, I used to get a lot of traffic to my website from Twitter — now, not so much. I still use Twitter, but I now focus on social networks that bring in traffic, especially the kind that will buy from me — my target market. I find Facebook much more valuable, especially my group, which I call my social media marketing tribe. Feel free to join us and share your great content with the group. Trust is a big word… it’s important. And trust in marketing is low because for years we’ve made promises to consumers then failed to meet our obligations. Firms have a lot to do to make up for this. Get your target audience involved with you. Ask questions on Facebook. End your blog posts by asking for feedback. Participate in Quora conversations. And, make it easy for your target audience to engage. For instance, I use a plugin allowing visitors to comment using their Facebook profile. The plugin also brings comments from Facebook back to my blog. This increases engagement. Don’t just pretend to care about your visitors — truly care about them. That means responding quickly when they post a question or concern. Remember, social media is always on, so plan for responses during the evening and on weekends. When visitors share your content or comment on a post, thank them and consider ways you can repay the compliment. Building community means being a good member of that community and helping everybody out. Don’t think about yourself — think about your community. Why are they engaged with you? What are their pains? How can you help? I recently met with a client interested in using social media to connect with younger prospects. Yet, they were uncomfortable when I suggested we find out what types of posts might help these prospects, they only wanted to talk about themselves in their social media marketing. FAIL! You can never plan too much. And, planning isn’t done — you need to constantly update your plan as things change. I commonly suggest to clients that we meet on a monthly basis to review results and plan for the next month’s campaign. Putting your social media marketing on autopilot isn’t going to optimize your opportunity to make money with social media. Contingency planning should also be part of your social media marketing plan. Social media marketing is, by its nature, less predictable. You never know when someone is going to say something off the wall or where they’re going to choose to say it. You need a contingency plan so when something bad happens, you’re ready with a response. Recently, Jesse from Jess3 behaved badly at a conference. I wasn’t there, so I don’t know the details. The important thing is he quickly responded and apologized for his poor behavior before others started complaining about it. Social media is great because there’s so much information available, but don’t get sidetracked with vanity metrics like # of Fans or Followers. These don’t translate well to conversion, so keep you eye on the ball. Assess things related to making money with social media — things like reach, SEO, and conversion. Be sure to assesses these metrics in a way that helps you focus your efforts on creating more content that performs well. Don’t bury your head in the sand. Listen. It’s important, as mentioned above, the listen and respond to both positive and negative comments and answer questions quickly. Notice that many of these tools integrate together and reinforce each other. Cool. Integration is really the name of the game. Need help putting together a killer social media program that helps make your marketing SIZZLE? We’re here for you. You can access free content such as our FREE 66 page ebook on making money with social media and posts to this website. Need more help? We’re here for you. Simply contact us and we’ll show you how affordable making money with social media marketing can be.